I am not saying I am Die Hard HostGator fan, but they are undoubtedly biggest shared hosting provider, claims to host over 8000000 website. I personally hate those Shared Hosting package, not only from HostGator, but from other provider too. VPS is a good starting point, but Dedicated is best. 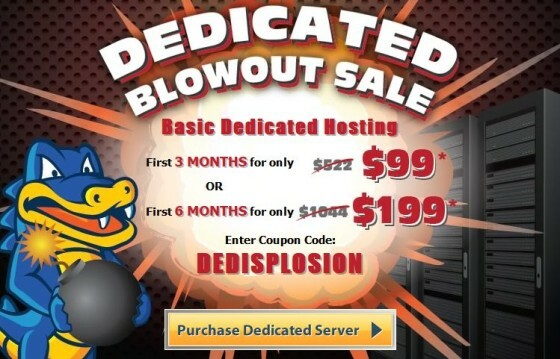 Today I suddenly find out the Basic Dedicated Server by HostGator is on sale, not just any sale, a massive sale. This server usually costs $174 per month, and in today's offer you will really get it in only $99 USD for first 3 month or $199 USD for first 6 month. Means direct $423 or $845 discount. Its dedicated server, so you could install whatever you want. And if you are not server geek, then also no issue, it comes cPanel and all basic stuff Preinstalled. And HostGator really have a fanatic support, via phone or email it always works. What Could Be Its Best Use? Direct $423 or $845 discount for 3 month and 6 month plan. * Please note this special offer is a limited-time promotional price available to new customers and is valid for the Initial Term only, not for successive or renewal periods.